Our company, garage door repair Santa Barbara, provides you an option of choosing between renowned manufactures such as Amarr garage doors, Wayne-Dalton garage doors, 1st United garage doors, Raynor garage doors and many more. We provide the service of delivering the new garage door you selected for your home, removal of old garage door and installation of new garage door. Garage doors are of different types each with its own purpose and specifications. 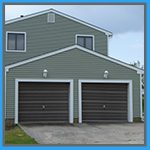 Such as, 16 x 7 garage doors are created to provide access to two vehicles at a time. Again there are 8 x 7 garage doors that are made for only one car at a time. The difference is found in shape, size, colors, additional features and raw materials too. By referring to our catalog you can have a clear idea what type of garage doors we offer. Just contact us if get a high quality garage door installed on your property without any hassle and save money as well. There are different types of garage door openers available in the market and different specifications for different manufacturers. Our company has full knowledge of these garage door openers as we ourselves have a huge stock of these products. In reality these openers look all the same involving an electric motor, but you would be surprised to know that you would need a specific garage door opener to work with your garage door. For this reason our technicians would prove to be useful to help you identify which garage door opener you require to run your garage door. Have a look at the following sections to know about these sophisticated sensors. 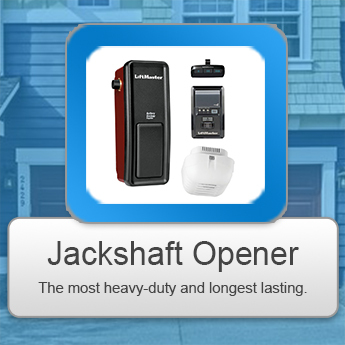 This knowledge would be helpful for you to determine that what you really expect from your garage door opener. 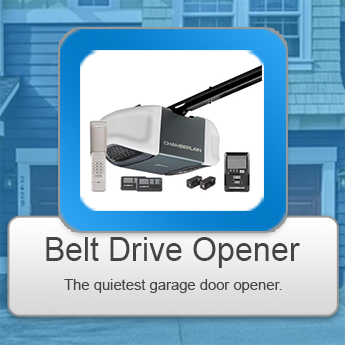 Belt-drive garage door openers are sometimes considered to be the best choice. These openers are internally the same as the chain drive garage door openers. But instead of metal chain, a rubber belt is used for its functioning. This gives a huge edge in which the noise factor is minimized to a great deal and also it requires very low maintenance and repairs. Just give us a call and order it. 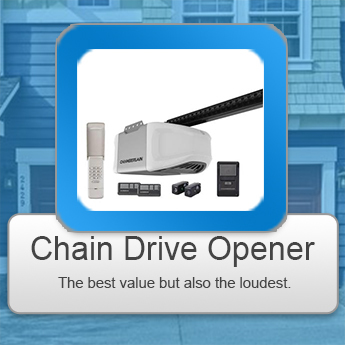 Among all he types of garage door openers, chain drive garage door opener are the most trusted and popular one. It’s the least expensive among the openers which is operated by a chain but does make noise while it is functioning. Sometimes it is advantageous to hear some noise while the opening of the garage door which alerts the residents when the garage door is being opened. Apart from providing security, these garage door openers lasts for a long time without trouble. There are other garage door openers which operate quietly but are a bit more expensive. The choice is yours. Just give us a call and we will get in touch with you. 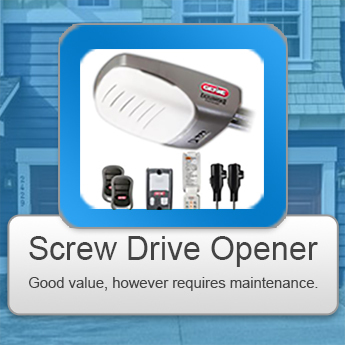 Among all the garage door openers, screw-drive door opener is the second best choice. A rotating screw causes the garage door to open or close with this type of opener. As the screw-drive garage door opener comes with less moving parts they automatically require less maintenance and repairs. It is also much quieter than the chain-drive openers for the same reason. Torsion-drive garage doors are a new type of garage door openers. They are usually mounted on the top of the wall at a corner of garage door connected to a torsion spring shaft. As these are mounted on the walls of the garage rather than on the ceiling, a torsion drive garage door opener saves about 8 inches of space above the ceiling. These types of openers are used for garage doors which are lighter in nature. They have a better noise performance than that of chain drive garage door openers. But if you are to install a torsion drive garage door opener, then first of all you need to make sure that your garage door is prepared with its required accessories to get a torsion drive garage door opener installed with it. 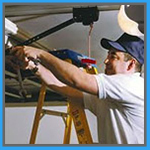 If you have a low ceiling, this garage door opener is a best choice for you. Just give us a call and we will install this new garage door opener at your place. In case of any problem regarding the garage door spring, just contact us and we will provide you with the solution. The spring is usually centered on the top of a garage door and some of the springs are mounted on each side of the garage door. These springs are helpful in lifting heavy weight of the garage door. These springs do not create much of a problem as its life span is much higher, about 6-8 years. It can be increased to above 12 years if serviced properly. We are here to make sure you do not get a complaint regarding this matter. If the spring completely fails to function, we can replace it with the new ones which you can choose from our wide variety. We are just a call away.